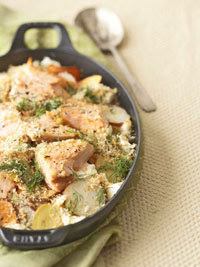 Feta cheese and potatoes are layered to make a side-dish casserole, then salmon is added on top to make it a main dish. Heat oven to 375 degrees F. Stir together 1 tbsp melted butter, panko, zest from lemon and dill; set aside. Butter the bottom of a 2-quart casserole dish. Cover the bottom of the pan with half the potatoes. Season with some of the salt and pepper; sprinkle with half the feta. Repeat, topping with remaining potatoes, feta and some salt and pepper. Combine 1 tbsp butter and the broth; pour over potatoes. Cover and bake until potatoes are just softened, about 45 min. Meanwhile, cut salmon into 2- to 3-inch pieces and toss with lemon juice; sprinkle with 1/4 tsp salt. Remove potatoes from oven. Increase oven temperature to 425 degrees F. Place salmon over potatoes and sprinkle with bread crumb mixture. Bake, uncovered, until salmon is cooked through and bread crumbs are golden brown, 12 to 15 min. Garnish with dill springs. Serves 6. Calories 430, Total Fat 20.5 g, Saturated Fat 7.5 g, Cholesterol 87 mg, Sodium 724 mg, Carbohydrate 34 g, Fiber 4 g, Protein 28 g. Daily Values: Vitamin A 0%, Vitamin C 0%, Calcium 0%, Iron 0%. This entry was posted on 3:12 PM and is filed under Fish and Seafood . You can follow any responses to this entry through the RSS 2.0 feed. You can leave a response, or trackback from your own site.